There was a panel on at #vircomm13 the other week about The Business of Community - Monetisation and Marketing. It spurred me up to write about this as it is something close to my heart and the things I do on a daily basis for my business/community. What gets to me every time is the total avoidance in discussions of how communities can make money. And how the term ‘making money’ and ‘communities’ is deemed as some kind of ‘no-no’. There is often talk of ROI for communities. And also talk of figuring out how to better align the goals of communities and the members, but the idea of selling to users is frowned upon, dismissed and avoided. 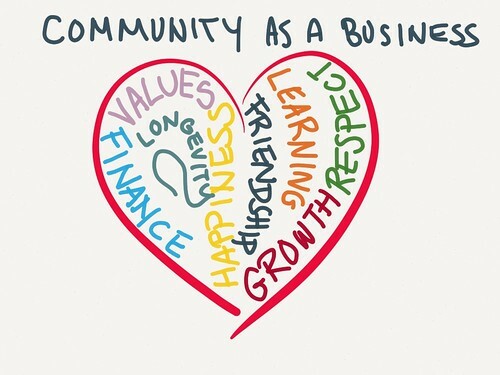 However, if we really start to look at communities dotted across the web I think we’ll start to find successful businesses that rely on community to be in business. I’d like to see much more talk about sustainability and communities in a business and financial sense. I’d like people to stop shaking their heads when the talk of making money comes into play. I’d like to see more creativity in the way money is made - surely we can do better than the default ‘displaying ads’ business model? I think sustainability is key for any community to allow it to grow. In most situations communities are built with the intention to last. For them to last they need to justify their existence - to the ‘owners’ and the ‘members’. How each community achieves sustainability will be different. There is no best practice, each community has its’ own unique challenges. In the software testing world many of us are familiar with the term ‘context driven’ - we must consider the individual situation which we operate under - every situation should have its’ context taken into consideration. A branded community, for example, will need to prove somehow (perhaps through metrics) that the community brings value to the business. The community will have a much greater chance of support and survival if value can be proven. Smaller independent communities, like the one I run, need to achieve sustainability by other means. Having metrics in these situations is all good, but if it doesn’t bring in the money at the end of the day then the community will die a slow death. By being sustainable (for small/niche communities) I mean more than covering the software and hosting costs. Sustainability for me means allowing the founder(s) and people who run the community to get paid for what they do. Wouldn’t the world be a better place if these people who start important communities could invest their efforts into building these communities into something even better without worrying about holding down a full time job or feeding their kids? Imagine if the people who start these trends could do more: re-invest more of the time and the resources/money they make into making the community an even better and more valuable place. I personally think this would be awesome. There are niche communities dotted around the web where the founders have created something special and unique. We should be supporting these niche communities because of their uniqueness. Their individuality. Their ability to grow without bureaucracy. The chance to achieve change. But perhaps most importantly because the founders most likely have their community in their heart. The founders of these communities want to do the right thing. Something deep inside them has driven them to start it in the first place. They wouldn’t be thinking and asking ‘how can I monetise my members?’. This is what I call the win-win scenario. Creating something where both the members and the owners feel content with what is being created. The owner’s hearts are in the right place and the members feel respected. It’s not always easy to achieve, but is certainly possible. Shock horror. I monetise my community. I really do hate the ‘monetisation’ term, but I have used it here to just to conform to what people understand. I started a community 6 years ago. It never made money in the first 4.5 years. Any money that was made just covered the costs. It was a part time hobby that was going somewhere, but eating up so much of my personal time. I wanted to make it so much more, but to do so would mean risk for me and dedicating myself ‘full time’ to it. So I made the jump. For the past year or so I’ve been making money from it. I’d probably make more money if I went out and got a proper job, but then I’d never see my kids and my actual living expenses would go up. There are pros and cons everywhere. I don’t think it is wrong that I am making money. I’d like to think my community members would agree. The funny thing is I’ve never felt so content with what I am doing - I’m finding that work-life balance that I’ve been so desperate to have. I feel intellectually challenged. I feel like I’m learning every day. I have the freedom to do what I think is right. I love what I’m doing, in the most cheesy way. I’m not asking ‘how can I monetise my members?’. I do know that I have an opportunity. It’s not an opportunity to monetise. It’s not an opportunity to create a startup and get acquired (and then close down months later). It’s an opportunity for me to learn, grow and make a difference to the software testing world. It’s an opportunity to create a financially sustainable community. It’s an opportunity to create change in a software testing world that I believe needs it.